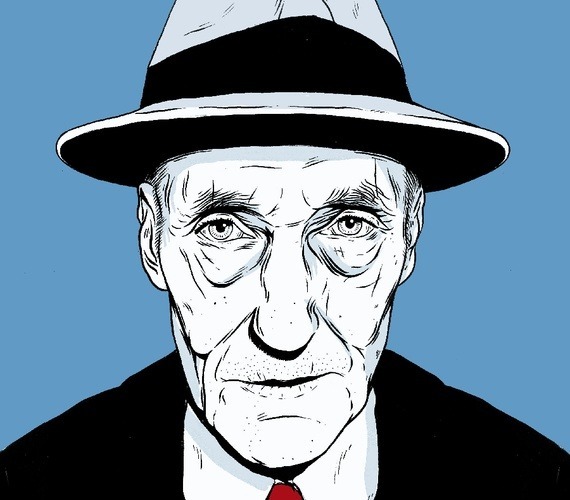 A new biography reveals a William S. Burroughs both ghastlier and more impressive than many previously thought. Call Me Burroughs by Barry Miles; Twelve. The Naked Lunch, to misuse the theologian René Girard’s characterization of the Bible, is “a text in travail”—which is to say that it contends with itself, it ruptures itself, it leaks ectoplasm all over the bookshelf. It is also a work of exalted and orthodox modernism, a mind-blowing collage that might be—in fact, let’s just say is—the truest successor to T. S. Eliot’s The Waste Land. “Moving through odorless alleys of space where no life is, only the colorless no smell of death”—here is Eliot’s spiritual catastrophe translated onto the global vibrational plane of junkies in the dawn, and Eliot’s voices and visions accelerated, with a loud whine and a smell of burning, to the speed of science fiction. By cosmic coincidence, Burroughs and Eliot were both from the well-to-do side of sleepy St. Louis, although a generation apart: “Bill’s mother,” writes Miles, “had waltzed with Tommy Eliot at dance class.” Burroughs would later attend one of Eliot’s lectures at Harvard, noting with approval the older man’s decorousness. The Beats’ influence, their electricity, passed ultimately not into literature but into rock and roll. But if Eliot was Burroughs’s kind-of celestial uncle, remote and austerely sane, his blood brothers were his fellow loonies of the Beat Generation. Allen Ginsberg was his devotee, then his lover, then his champion. In Tangier, Jack Kerouac typed up portions of The Naked Lunch, and supplied the book’s title. The Beats constituted a metaphysical insurrection and a mutual-blow-job society, and their influence, their electricity, passed ultimately not into literature but into rock and roll. Burroughs, a late bloomer writing-wise, was the most cerebral of the crew. His writing prior to the implosion-consummation of The Naked Lunch zigzagged between tabloid hyperbole and alienated cool (Queer, in particular, has the feel of an early Godard movie); his writing after The Naked Lunch was scarcely writing at all. Embracing “cut-ups”—literally, scissored columns or slices of print, rearranged in defiance of sense and narrative—and privileging his rattiest paranoiac twinges, he cranked out page after page of oracular drivel: The Soft Machine, The Ticket That Exploded, Nova Express … “Word dust everywhere now like soiled stucco on the buildings. Word dust without color drifting smoke streets. Explosive bio advance out of space to neon.” These books do have their fans, some quite distinguished: Marshall McLuhan read them as “a kind of engineer’s report of the terrain hazards and mandatory processes which exist in the new electric environment.” Best to see them, perhaps, as a prose analogue to Lou Reed’sMetal Machine Music: four album sides of twisting, howling feedback in which are buried (legend has it) classical motifs audible only to the recently electroshocked. Burroughs was a clinical mind in a voodoo universe, and the Ugly Spirit could move him to pettier ends as well. Call Me Burroughs records a quasi-magical revenge attack on a Boulder deli from which two of his opiated friends had recently been thrown out. First, Burroughs arranged for a surreptitious tape recording to be made inside the deli—ambient noise, kitchen clatter, waitress-customer banter—and then, days later, with equal surreptitiousness, he played it back from a cassette recorder inside his coat as he sat at one of the tables. As Miles writes: “Over the next hour he increased the volume so that you could just about hear it, but no one appeared to notice.” Yet subliminal damage was being inflicted: discontinuous time streams, information feedback. “After forty-five minutes … one of the waiters threw down his apron and stalked out, followed by the owner, arguing loudly. The owner returned and began to scream at the serving staff, sending two of the women running to the ladies’ room in tears.” Burroughs, psychic vandal, was 63 years old at the time of this incident. Genuine squalor always contains the possibility of holiness, and every hustler pays his back taxes to the truth, but Burroughs was not a moralist. Redemption? No thanks. He was, however, a ferocious and self-abandoning artist, half insane with the future, and quite dedicated to the destruction of a worldwide control conspiracy whose instruments were language, time, and meaning. Call Me Burroughs ends with the old boy, having survived an improbable 83 years, padding around Lawrence, Kansas, with a gun on his hip. He wakes at 8 to take his 60 milligrams of liquid methadone, naps, reads, feeds his cats, gets high, carps in his journal about his non-abduction by aliens (“Why are abductions and contacts always to mediocre or inferior minds? Why don’t they come and see ME?”). Until, on August 2, 1997, at 6:50 in the evening, a cardiac arrest propels his soul—where? Toward hell, heaven, purgatory, the bridge of a throbbing starship, or, more likely, some fractured limbo of his own invention. James Parker is an Atlantic contributing editor.